Deadlines, by their logic, should never be an issue. You are asked to deliver something by a certain time and you agree that you can. So, if we feel it is something that we are capable of doing, why do deadlines so often cause such a wild panic as they approach or get missed altogether? The reason why this happens, according to research, is that we tend to base our estimates on the best possible scenario. One where we’re in the zone, with no distractions, and nothing urgent comes up to take up your time. That is obviously an ambitious assumption because, well, life is never so simple. 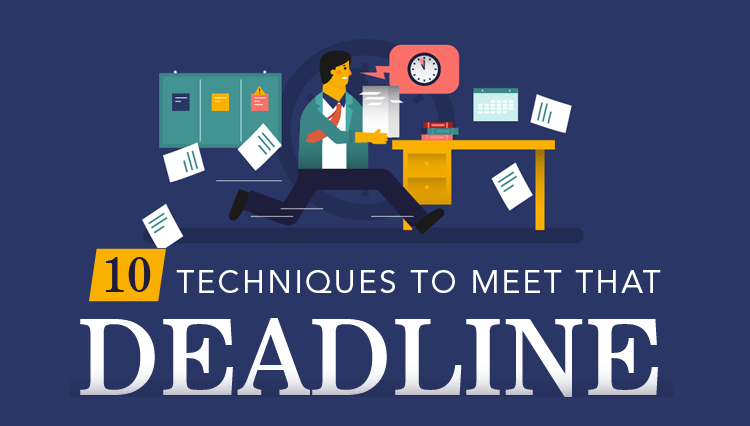 So how can you get better at keeping your deadlines? For a start you can get some great tips from this infographic created by SavingSpot. By using a technique, such as Critical Path Analysis, you can identify the elements of the deliverable and lay out the order in which they should be completed. Before beginning your task, ensure that you have access to everything you will need to complete it. For example, if you need equipment, executive sign-off or access to an expense account it will prevent future delays if you have clearly identified and secured these at the beginning. One of the biggest issues in deadline estimation is that we want to be seen as being more skilled than we are. This leads us to overestimating our capabilities and underestimating how long something will take. Be clear and honest about what you can do and if necessary add on extra time to your expected delivery date. Task managing apps such as Todoist can help you to regulate your time and keep you focused on the task at hand. Though it’s impossible to say that you’ll never miss a deadline again, at least by following these tips you can get a good start on trying to handle them better. Thus, you can cut down the associated stress and anxiety that deadlines can cause.